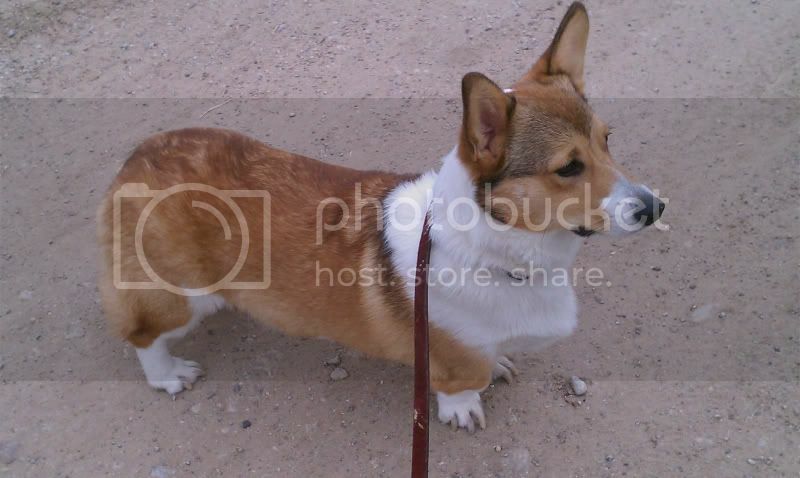 I now have a sable corgi! Meet Nora! Hi there everyone! I just joined and I am so excited to ask some questions and share the corgi love. Hopefully there are still some people around on this site. Question :my corgi baby, Bentley is a Sable boy and is almost 15 weeks old...do you think he will keep his black rings under his eyes? Koda is a lighter sable... Wish he ended up darker, but I LOVE sables! Excuse his nails in the pic, he had vinyl nail caps on after I got my wood floors refinished, lol! Sorry meant to post this picture of our dog's head when he was a puppy. Your very cute puppy is a much darker colour than our dog ever was so he will probably turn out a sable and keep his mask. Our dog was registered a sable but turned mainly red and white - he still has some black in his coat. Your puppy is beautiful. Hard to tell what they turn out like either he will keep some sable or will turn out a nice red (darker than the normal red) that's what happened to the grey on our dog. I´m pretty sure he is a sable, he has a little bit of white around his nose and down his neck and chest and has white toes. Do you know how much his color is going to change, and how far are the white parts going to spread? Did anyne had a similar puppy that can show me the puppy vs. adult pictures?